Typically I cut them into thirds, and vacuum pack them so that they don't smoke taint everything else in the freezer, and then freeze them. I have never dry stored salami before, but had a chat to the butcher when I dropped the meat off and he said that provided they are kept cool and dry, they will last indefinitely, but will progressively get more and more dehydrated and therefore harder. I have an acre of bush next to the house and was thinking that maybe a meat safe might be the go?? 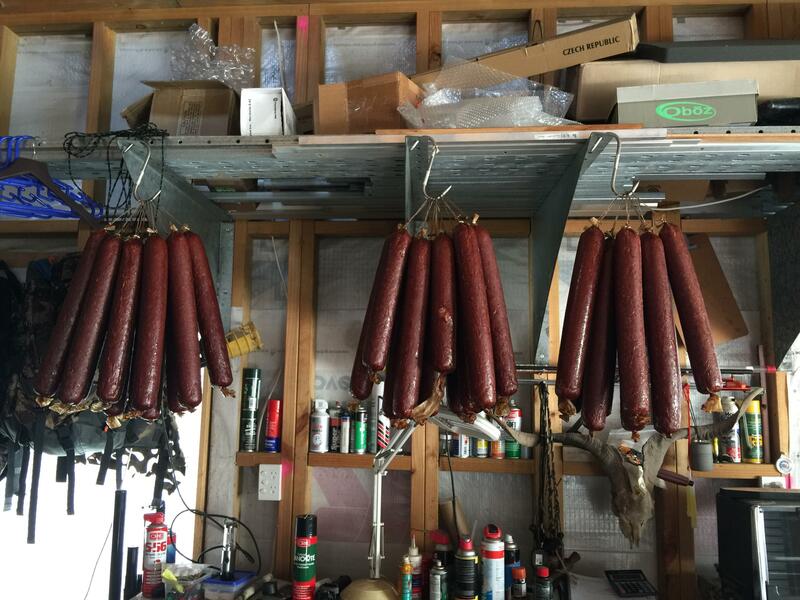 What do you guys do to store your salami? Dry almost to preferred level and then freeze. I have always frozen them. Depends how dry you like them, 8-10 days hanging in a fairly warm garage seems to get them about right for me and then wrap individually in plastic bags and put them in my meat freezer. +1 on that.....I have tried just hanging them in the shed and they dried out to baseball bat consistency. Rub cooking oil on them and wrap in glad wrap then freeze. When they thaw they need a couple of days to dry out. I'll hang them in the workshop until the weekend and then see what they are like. Beaker and septic like this. Fermented salami will keep longer than cooked salami without freezing. Your stuff looks really tasty! I can see its smoked but it may be cooked rather than fermented, so once it dries to your taste it may be better to hold it at that by freezing. Send it all to me for storing. Some weight/item 'wasteage' may occur...... but you get at least 1-2 back. veitnamcam and Gapped axe like this. Fermented Salamis need time to ferment properly so hanging is good. They should get a part of white mould on them like a brie cheese. I like them shrunk to about half the size they start at and hard on the outside but soft in the middle. I've found it better to hang them separately.. You get a more even drying and where they touch can look a bit dodgy... Leave them hanging for up to a week or so then if you have a friendly butcher ask if you can use his slicer... Slice, vac pak into serving size portions then freeze... Easy as..
... Slice, vac pak into serving size portions then freeze... Easy as.. I'm confused ........ They came pre-wrapped in serving size portions direct from the butcher! veitnamcam, Beaker and Biggun708 like this. Oh what a difference 4 days hanging in the shed makes! I have to say the salami has 'developed' well with the outside just starting to wrinkle, and when you cut unto it it has a nice hard 2mm outer layer with a lovely firmness to the main body without being too dry. Bloody awesome! Not sure if its the salami that make the beer taste better or the beer that makes the salami taste better, but give me another cold one and an inch of salami! Shootm, veitnamcam, kokako and 2 others like this.